Short issue this month. Too many places to be, too little to write about. Hopefully we'll see some of you wonderful readers at the Chalke Valley History Festival this weekend. For those who can't make it, we will have pictures online somewhere and a report next month. Don't forget that the brand new audio drama of Unseen Academicals comes out on Monday 2nd July, more details later in this issue. Hopefully we will have a competition prize for you next month and if you are really lucky some Disctrivia written by us for a change! 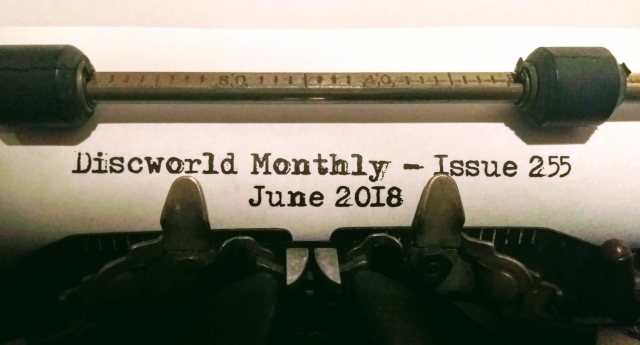 The deadline for submissions to issue 256 of Discworld Monthly is Tuesday 24th July 2018. 2.1 Chalke Valley Festival is Here! Beware The Shed of Doom! I know we are squeezing it time wise, but this weekend is THE weekend to be in Broad Chalke at the Chalke Valley History Festival. A talk by Rob Wilkins about Terry, a magical time travelling show by Ankh-Morpork's own Guild of Conjurors, Discworld Monthly's own Collection of Loonies and a conversation with Paul Kidby and Rob Wilkins are just some of the Discworld highlights that will be happening this weekend. The Shed of Doom takes centre stage (Discworld wise) with its amazing recreation of the Evil Harry Dread's shed which takes you through to an exhibition of artwork and artefacts which belonged to Terry and the wider universe of The Disc. Many objects will have never been seen before, and the recreation of Terry's office will also be in attendance for those who didn't see it at Salisbury. We want you to join us for an amazing photograph of fans. We love costumes so come along as your favourite character or where you favourite Discworld T-shirt! Be there or be a .. Oh just don't miss out !! We told you about this in last month's issue. If you miss the Chalke Valley History Festival then don't miss this! As soon as we know where else it is headed next, we will shout loud and proud ! Last month we told you that the next three in the DIscworld Collector's Library editions would possibly be Thud!, Making Money and Unseen Academicals. Cover images for both Thud! 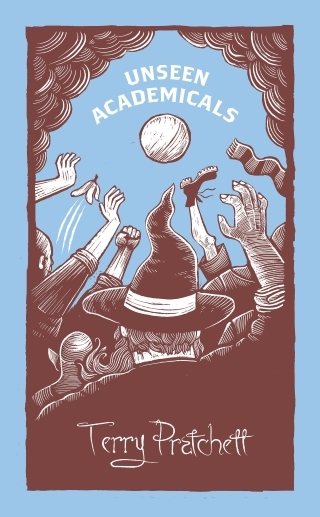 and Unseen Academicals have surfaced along with some pre-order links. 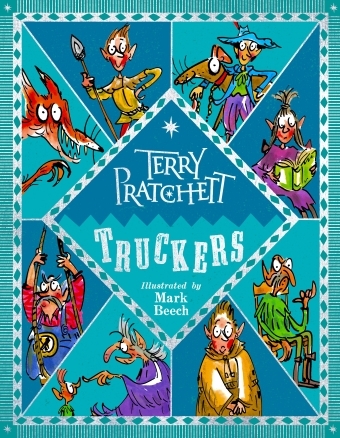 We also told you about an Illustrated edition of Truckers. We now have a cover image and full release details for you. It will be released on the 18th Oct 2018 with full page colour illustrations by Mark Beech, published by Corgi Childrens. Some detective work has possibly revealed that Laura Ellen Anderson may well be doing a brand new cover for Dodger. This would make logical sense as Dodger could be read by those in the younger age bracket and to brand it with the Young Reader fonts and styling would bring in new readers to one our favourite non-Discworld books. More info will come as we find it. Also,The Colour of Magic turns 35 years old this November, an anniversary edition keeps dipping in and out of my sources circles. I wonder if we will get a beautiful anniversary edition like the 25th anniversary one? Don't forget this gets released on Monday 2nd July. It's not an audiobook, but an audio play. Think Hitchhiker's Guide to the Galaxy style or the wonderful Good Omens that the BBC brought to us a while back. The full cast list has now been revealed with Dirk Maggs directing. Tom Alexander, Samantha Béart, Pippa Bennett-Warner, Mark Benton, Stephen Briggs, Stephen Critchlow, Jon Culshaw, Phil Davis, Ray Fearon, Tony Gardner, Edward Harrison, David Holt, Mathew Horne, David Jason, Josie Lawrence, Toby Longworth, Harry Myers, Maggie Service, Andrew Spooner, Steven Webb, Keith Wickham and Jaime Winstone. They are waiting to see if they have been accepted into some film festivals. As soon as they are I am sure we will get informed as to where and when. This month we put a call out to some of our friends and they came back with some rather varied Trivia questions. We've not really validated the answers (we trust our friends - although looking at the Readers' letters this month - maybe we shouldn't!) . Q1. What's the name of Twoflower's dragon? Q2. Who said, ' I SAID, I've come to sell my lovely apples, Don't you listen? Q3. When researching for Carpe Jugulum in 1997, what was the one question STP asked every person at his book signing? Q4. Which Morporkian died in a cave in Holywood. Q5. Who taught Vimes everything he knew. It's 5th November and a man has just set fire to a Somerset mansion. We learn that he doused everything "including the bodies" in petrol and set off Calor gas cylinders before doing so. When he stops to throw up, the revolver in his pocket bashes against the side of his van. Thus begins Dovetail, a novel by Bernard Pearson of the Discworld Emporium. After the dramatic prologue, chapter one is titled "three months earlier". We are introduced to Bill Sawyer, a Somerset furniture restorer and lovable granddad. In chapter 2, titled "Tuesday 14th August", Sawyer is visited by Darren Skates, a notorious villain, and his psychopathic henchman. Skates wants a set of famous Elizabethan chairs restored. The tricky part is that he only has three chairs but wants the restoration to result in a set of four chairs that an expert would declare authentic. Bill is caught between a rock and a hard place. He wants to refuse the job but Skates will not take no for an answer and he's a dangerous man to cross. On the other hand, Bill knows that once Skates has what he wants, he is unlikely to let Bill live in peace. Bill has to use his wits to protect himself and his family. While investigating Skates' past, he meets Lucy, Skates' traumatised ex-wife. The two join forces and, along with Bill's best friend, Sid, and formidable elderly neighbour, Miss Templeton, they plot to beat Skates and Warren at their own game. Bernard Pearson is a bit like a rude Father Christmas. He's a big jolly man with a beard who makes wonderful things and swears like a trooper. He's full of colourful tales, many too disreputable to repeat in print and is often called "Uncle Bernard" because he is the living embodiment of avuncularity. So far, his written output has been companion volumes to the Discworld novels, such as The Discworld Almanak and The World of Poo. He is well known at Discworld events, which often end with him giving the fraternal farewell ("Piss off!") . My husband and I have a word, "bernardage", which broadly means the kind of thing Bernard Pearson would say. We once even invented a history for the word with citations from eighteenth century plays. Think robust, ribald and humorous. While Dovetail has the occasional Pratchettian touch (a drink made of "mainly apples" features prominently) , it is pure bernardage. At its heart it is a celebration of craftsmanship and friendship, appropriate for a craftsman who has brought so many friends together through the Discworld events he ran in Wincanton for many years. The story continues with the dates heading the chapters, leading up to November 5th, the day of the fire. The reader already knows what will happen on that day. The interesting part is learning how the characters get there and what happens after. Appropriately, it is the relationships between the characters that form the bulk of the story. While there is a lot of Bernard Pearson in Bill Sawyer, he differs from his creator in that he is a solitary creature who lives on a remote farmhouse with his dog. In order to defeat Skates, he must forge a strong alliance that will hold together like the eponymous dovetail joint. The story is compelling and rich in detail. The reader is drawn into the murkier side of the antiques trade, which is truly an education. It also poses a dark question to the reader: what would you be prepared to do when your family is threatened by dangerous criminals and you know that the police will be of little use? 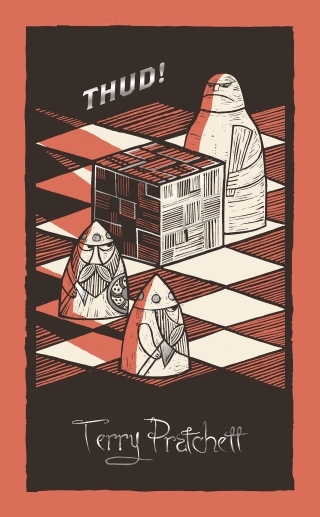 Dovetail is Bernard Pearson's first novel but, hopefully not his last. Now that he has turned his hand to fiction, he has approach the task as a true craftsman, taking pride in his work and filling it with loving detail. In the blurb, he credits Terry Pratchett with inspiring him to take up writing and this book is a worthy tribute to Terry's memory. I would recommend this book both to Discworld fans and to readers who would never touch a fantasy novel but love a good old-fashioned Roundworld murder. A small group of us went to the final night's performance of Mort at the Caversham Park Theatre (19th May 2018) on a rather warm and beautiful Saturday night (I'd previously seen Maskerade here many years previous) . We were greeted by friendly staff and purchased drinks (and some lovely locally produced fudge) while waiting for the performance to start. Scattered around the lounge were photos of the rehearsals and from a cursory glance the characters seemed to look as we might expect them. We've seen several groups perform Mort over the years and based on our most recently experience were somewhat concerned how the Caversham Park players would approach the play. Thankfully, they decided to stick closely to the script keeping the staging simple and allowing for quick scene changes. The performances throughout then ensemble were solid. There was a good range of ages in the cast and while no one actor stood out from the rest there were no dud performances and very few promptings. Eddie Docherty and Gabby Bianco made a good partnership of Mort and Ysabell and Dan Bretherton made a solid Albert. For me the performance was solid, everything was just so and there we very few surprises and nothing stood out as outstanding. The rest of the audience appeared to enjoy themselves and there were a few laugh out loud moments. I get the impression that most of the audience didn't really know Terry's works so were probably somewhat baffled about what was going on. Overall we enjoyed the show, much more than the previous one we went to where Death's domain was full of 60s disco colours. For a solid, down the line, production the Caversham Players can't be faulted. If the Caversham players decide to do more Pratchett productions in the future I'd be happy to go again. ↑≡6. Review: Wyrd Sisters in Sheffield. On 13-16 June at the Drama Studio in Sheffield, the Stephen Briggs adaptation of Wyrd Sisters was the summer production for Sheffield players The Company. For those who missed it (stop reading now!) there is an open air performance at Dore Village Green on July 11th. The Drama Studio is a proper theatre and the stage setup with multiple levels from front to rear allowed for action to take place in the foreground and further back, with dialogue switching between the different parts of the scene. This was aided by lighting changes to shift the focus. Alongside the well chosen and sparingly deployed music, all of this demonstrated a slick and professional production. About 90 folk turned up for the final indoor performance and were treated to a well polished show which took a lighthearted approach without any cringeworthy melodrama. Emma Portus was, as my friend commented, a little young to play Granny Weatherwax, but otherwise looked the part in her plain, smart outfit and with a wonderful range of facial expressions from confident authority to total bewilderment. She was ably accompanied by a wonderful Ken Rowe as Nanny, playing her with bawdy mischief. Jamie Morgan gave off boundless nervous energy as a naive but determined Magrat Garlick. John Ansari was a disarmingly good Duke, confident and commanding one minute and utterly anguished the next. Alongside him, Mandy Sims was a terrifying Duchess, if perhaps a little too serious in a play which otherwise had a light touch. The rest of the cast carried their parts admirably and garnered many laughs with their playfulness and slapstick, especially the Players. A special mention should also go to Pip Mason as the Fool, who delivered intelligence and nuance and really developed a bond with the audience, who rooted for him throughout. All in all this was a funny, skilful and accomplished performance of Wyrd Sisters, and I hope The Company will take on other Discworld adaptations in the future. We assume any correspondence is eligible for use in the newsletter unless otherwise stated, including the sender's email address. We may edit your letters by throwing them down a zip line and crashing them in to a cargo net! * From: "Frank V. DeVoy"
This may likely be old news for many, but I've only just tripped over it. No, no, I'm fine … don't get up. In the British mystery series, Endeavour, in the Series 3 episode, "Coda", I caught a quick reference to TP's Discworld. Main character DI Thursday has just given a cigarette to a young female constable to help calm her nerves after she's witnessed a fellow constable get shot in cold blood. He tells her to keep the pack and gives her a bit of advice on how to secrete it on her person while in uniform. He says, "It's a little trick I learned from my old boss, Sergeant Vimes of Cable Street." DWM replies: I think I vaguely remember this being mentioned in the past. It's not a series that I am au fait with as I don't watch much television. I am compelled by a general sense of pedantry to point out an error in the Discworld Monthly quiz. The question was "Who is Tomjon's real father?" The answer given was "King Verence I". However, according to Nanny Ogg, who delivered Tomjon, his mother, the Queen of Lancre, confessed that his father was the notorious ladies' man who was also father to Verence II. The witches told the people that Tomjon and Verence were brothers and allowed them to believe that they were therefore the sons of Verence I. As Granny put it, they were bound to be truthful but there was no need to be honest. Pedantry aside, the word "real" raises an interesting point. One might argue that Tomjon's real father was Olwyn Vitoller, the man who raised him as his son. Granny's gift to Tomjon was that he would know who he was and in the end he knew himself to be an actor. As Hwel notes near the end, Tomjon is very much his father's son. It is great to see so many contributions in the latest DWM. Who is Tomjon's real father? I thought Tomjon father was the court jester as nanny ogg attended the queen who was never good at counting or was very close to the court jester. makes sense is 'wind that blows from the south-west' or 'African'. Don't forget the early bird prices for the Australian Discworld Convention will end on the 12th August and the price will then go UP! This month's issue is brought to you by the adventures in of Nat and Rach in a field getting lost and balancing on a log 15ft in the air whilst Rachel was standing on her head.. Please let us have any submissions for issue 256 of Discworld Monthly by Tuesday 24th July 2018. A3. Tell me everything you know about Magpies! 6. Review: Wyrd Sisters in Sheffield.